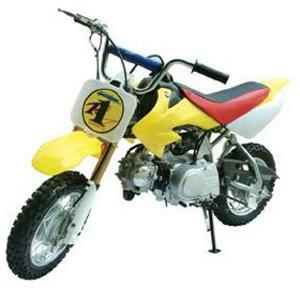 off road bikes 50cc power is what kids shout - do you know why? Easier Learning with Off Road Bikes 50cc for Kids and Teens. Looking for off road bikes 50cc and more usually lead a person to start with Honda. Believe it or not, other dirt bikes exist that are just as good, a bit better or maybe not quite as good. When deciding what to spend on a beginning bike rider that may not decide to continue riding, the Honda CRF50F/XR50 may have cost too much. 1. 2006 50cc DB-801A mini dirt bike being cleared out at $480 including shipping and handling. 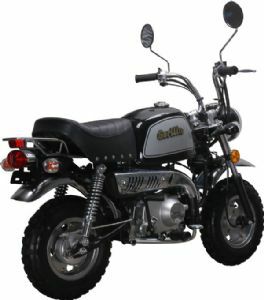 The 50cc engine is powerful and pulls the bike along rough trails and mud puddles. Because it is an off brand, the price is kept down. With 4.5hp and a maximum speed of 45mph, this air cooled bike has a manual pull or electric start. The automatic transmission makes it perfect for new riders. Parents are urged to watch carefully and ensure the rider maintains control. Tires are important on any dirt bike, so definitely be certain the bike you get will handle the terrain safely. 2. If you are a definite KTM family, your newest rider will enjoy the look, style and handling of the 2011 KTM 50 SX. Similar to other off road bikes 50cc or in that range, the bike weighs close to 86 pounds. Most kids will be able to right it after a spill. It has a 2-stroke motor. The base MSRP is $3299. 3. The Baja Dirt Runner DR50 50CC gas mini bike is a 4-stroke with a 4-speed manual transmission. That gives the newer rider good clutch training while learning to ride. It reaches a speed of 34 MPH. Built strong to hold a rider up to 110 pounds, the Baja is a great ride for young children and teens. With a price of $400 plus s&h it is definitely a model to consider. Before buying the bike, give the rider a say in the purchase. Whether it be off road bikes 50cc or a 150F later on, being part of the decision-making process enforces responsibility. Excitement can be had from a smaller motor. Off road bikes 50cc, have started to come into their own on many levels. They are light and durable and there are lots of makes and manufacturers building them. Ideal for novice riders, and beginners wanting to get used to these types of bikes but without the immense power. The lightness of a 50cc lends itself well to jumping too, and even more experienced riders may find these bikes indispensable for certain stunts they want to perform. With this type of bike (if your buying one), do make sure this engine size IS for you. Have a 10 minute ride on it - before buying the bike, so you know you’re satisfied to spend the money, and then GO have fun on your 50cc. We all like to go outdoors and ride our suzuki's and honda's around the dusty circuits. Although the kawasaki 125cc dirt bike is one of the more popular motocrossers - beginners could find this WAY too powerful. A dirt dog newbie wanting some mechanical two-wheeled recreation could be looking in this months MX magazine for some cheap rides – mainly a 50cc dirt bike. You might consider a motoX bike for sale in a classified ad or even a salvage yard – (with junkyard bikes be sure you have plenty of parts), as a salvaged motorcycle will need hours of repair. We cant promise you free motorbikes but take a look around with us at the great store(s) online for those off road bikes 50cc grunt. 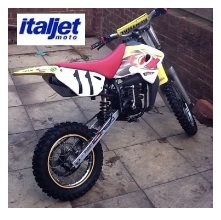 Funbikes.co.uk always seem to have something to offer the fast speed rider who likes a mini dirt bike for sale. And we found a corker – a FunBike KXD 50R - for sale at £345.00. The offroad motorbike has plenty of equipment such as a restrictable throttle, a full MX suspension, a simple Rev ‘n Go system and it’ll fit in the back of most hatchbacks. Suitable for circuits and challenging tracks or just messing about in a local field. Ebay came next in our search and we uncovered a modern and stylish ITALJET 50cc SCRAMBLER (dirt bike) at a starting price of £112.00. It had an automatic transmission, and output was shown as 12 Bhp. This was the “fast boy” model - Ideal for any teenager who wants a very cheap starter bike. We then spied a DERBI DIRT BOY; at a "buy it now" price of £595.00. Any child would love this as it comes with 10 inch rims and its complete with dunlop tires. The Derbi handbook was also included; and when bought new it was double the price of the current value. The only drawback was the paint which had some scuff marks. Ebay also uncovered a KTM 50cc Liquid Cooled Pro Junior Mini motocross bike. With 11 bids and a current price of £805.20, its one to keep our eye on as a number of riders wanted this one. Bikez.com was our last stop for off road bikes 50cc power. Once we got past the annoying pop-up we were intrigued by the Sherco 50cc Enduro model. 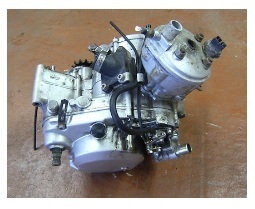 The Single cylinder engine (2 stroke) had an electronic ignition and kick start. With a Dellorto Carburettor and 6-speed gearbox the bikes pictures looked great. Sad thing was we could not see any approx retail prices - which was a shame. 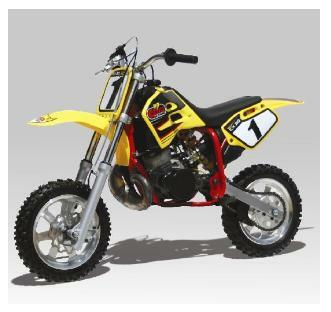 While looking at off road bikes 50cc engines, try not to buy used parts – such as brakes and hoses. And check over the engines, you don’t want to make your local park a polluted environment. A bike rider who likes custom built motorcycles will pay for the privilege. So is unlikely to have any mechanical issues as the mini off road bikes 50cc ride; will be new. But if your like most of us, check and double check when you buy parts; that they DO Fit! The same goes for MX clothing too. Measure everything twice before you buy, and double check your models year and name – it’ll save returning any spares later. If you have very little money, just go down to your local track and rent a small motorbike for a few hours. However you enjoy the dirtbike world, its all good. A 50cc bike is ideal for beginners or those needing a light and agile motorbike. Probably this type of bike may well be your first bike – or even first type of real transport and your not likely to forget it. So buy a bike you’ll love to ride, and one that’s easy to buy accessories and spares for. You don’t need a ride that will be the cause of endless head scratching and contention. Buy well and you will be glad you took your time – and that doesn’t mean buy new either. A pre-loved 50cc motorbike is so cheap you’ll wonder why you never had one before. Become part of the off road bikes 50cc power circle.